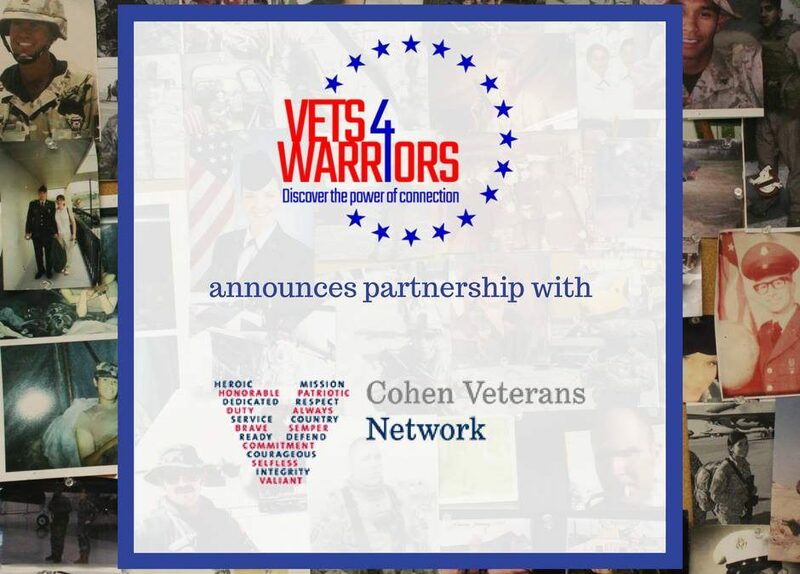 [Stamford, CT] – The Cohen Veterans Network (CVN) and Vets4Warriors today announced a new cooperative to help provide 24/7 access to services for veterans around the nation. Vets4Warriors will be offering access to their network of veteran peers to help extend CVN’s existing service to off hours, weekends and holidays for veterans, including National Guard and Reservists, military families and caregivers. The Cohen Veterans Network was launched in 2016 and operates seven clinics nationwide focused on helping post-9/11 veterans and their families with a variety of issues. CVN seeks to improve the quality of life for veterans by strengthening the mental health outcomes and complementing existing support with a particular focus on post-traumatic stress, an area that Vets4Warriors specializes in. CVN will have 10 clinics in operation by March of 2018. Vets4Warriors, which operates out of Rutgers University, is a peer support network operated by a team of veterans who provide personalized peer support for veterans, currently serving military personnel, their families and caregivers. CVN will utilize Vets4Warriors’ unique service to help extend their current support network around the clock. “This partnership will provide great value to veterans and families across the country. Vets4Warriors will be there for our clients when our clinics are closed, provide support to our clients who complete treatment, and enable us to enhance our telehealth efforts,” said Dr. Anthony Hassan, CEO & President of the Cohen Veterans Network. This partnership will ensure that veterans and military family members who reach out during clinic off hours, weekends, and holidays will be able to talk to a trained and empathetic veteran peer, who can then personally guide them to the local Cohen Clinic. These veteran peers will provide an understanding ear, and potential CVN clients in need will never be left alone even if a clinic is closed. The Vets4Warriors veteran peers will not be doing any counseling, or extending clinical care. By connecting veterans in need with a peer, the two organizations will be able to help veterans find solutions to their challenges and problems sooner rather than later and continue to improve their overall wellbeing. Vets4Warriors fills a critical gap between a crisis hotline and the many nonprofits offering direct assistance to veterans in need. To learn more, visit vets4warriors.com or follow them on Twitter and Facebook. To learn more about the Cohen Veterans Network visit cohenveteransnetwork.org or follow them on Facebook and Twitter. The Cohen Veterans Network is a 501(c)(3) national non-profit, clinically integrated mental health system for post-9/11 veterans and their families. CVN focuses on improving mental health outcomes, with a goal to build a network of outpatient mental health clinics for veterans and their families in high-need communities, in which trained clinicians deliver holistic evidence-based care to treat mental health conditions. Learn more about Cohen Veterans Network. Vets4Warriors is a national nonprofit, based at Rutgers University, that provides a live, 24/7 peer support network that any veteran, service member, caregiver or family member can contact for confidential conversations and trusted solutions to physical, mental or social challenges, before those challenges turn into crises. Learn more at www.vets4warriors.com or call 855-838-8255.